Solo #2 plays it safe with not much to offer beyond what you saw in the movie. 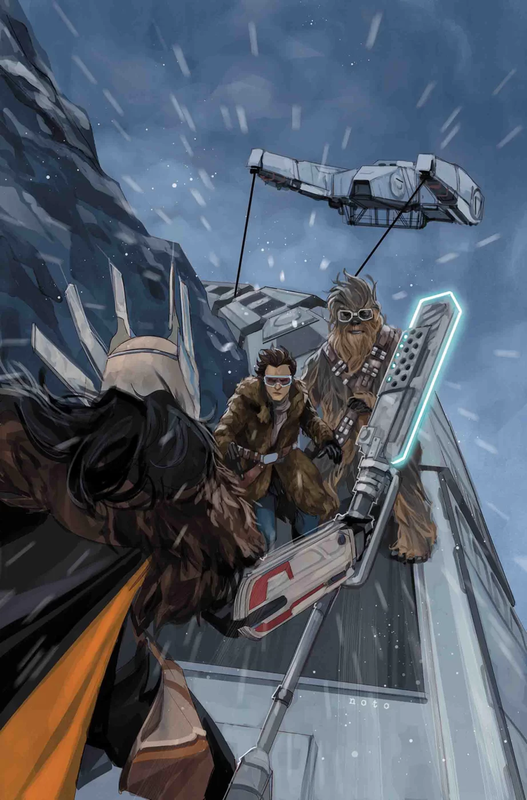 The issue opens with Han and Chewie fighting in the mud pit and ends with Han seeing Qi’ra again for the first time on Dryden’s yacht. For what it’s worth, it’s a decent recreation of the film in a comic book format, I’m just not sure what the point is. Trying to boil a movie down into a comic surely isn’t easy, yet Will Sliney does a good job of capturing the essential moments and dialog. There’s a couple places where things are extended a little, but it’s nothing that merits going out and finding this comic to read it. It’s a well done comic adaptation of a movie, but in the end, it’s just a comic adaptation. It’s not a new take on the film. The artwork does a good job of putting the story into pictures, though the artist does a better job with the aliens and technology than with the humans. There’s some great panels of Enfys Nest and Rio, but Han and Beckett are more stylized. They’re not that bad, but if you’re looking for drop dead gorgeous artwork, it doesn’t fit in that category. However, Enfys Nest and Rio fit that category. So in the end, it’s a mix. The bottom line is – what value is there in a straight, safe comic adaptation of a movie with decent artwork? To me, there’s not much worth in it at all. I’d pass on it. Thus I give Solo #2 a two and a half out of five metal bikinis.